Welcome to our farmhouse along the Baddeck Bay- giving you an easy 7 minute drive to the village of Baddeck, Bell Bay Golf course, and entrance to The Cabot Trail Or.....just RELAX and enjoy sitting on our porch in the middle of a 15 acre expansive quiet meadow view and "watch the world go by". Waterfront access to the Baddeck Bay only 3-4 minute drive from the farmhouse toward town. Enjoy our peaceful waterside setting. 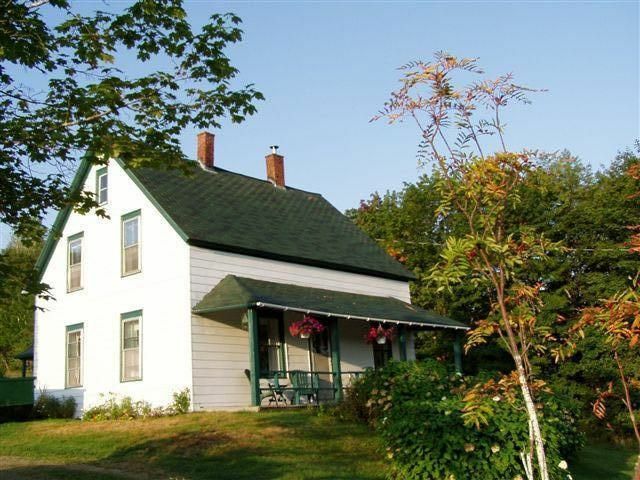 The farmhouse is located on rolling countryside just a few miles outside the village of Baddeck, Nova Scotia. Wireless internet and Cable w/HD TV allows for 24/7 connectedness- when YOU want it- and only IF you want it! Our family rental guidebook contains local information about restaurants, beaches, hiking trails and more. The 4 bedroom farmhouse has 3 bedrooms + 2 full bathrooms on the second floor, and an office/ futon bedroom on the first floor off the kitchen. An added bonus is the outdoor shower- useful for rinsing off after a beach day or try it by the light of the moon! CENTRAL LOCATION: Baddeck is a northern Canadian resort village on the shores of the world renowned Cape Breton Island adjacent to the Bras d'Or Lakes. Explore all that Cape Breton has to offer. Our cottage is just 3 miles from town along the Bay Waterfront. It is a great place to use as 'home base' on the Cabot Trail - which is considered 'the Beginning and the End' of one of the most scenic drives in North America. SWIMMING : Take the Baddeck Lions Club ferry ride over to Kidston's Island from the Government wharf to enjoy sandy beaches, lifeguard supported swim area with raft, and picnic tables for casual dining options. A favorite spot for so many! FISHING, RECREATION: Trout and salmon fishing are one hour away. Permits are available in Baddeck. Close to many fine beaches, trails for hiking, the Alexander Graham Bell Historic Site, Fort Louisburg and the Gaelic College. GOLF:Numerous enjoyable golf courses are minutes away: Choose Bell Bay Golf Course- only minutes by car, or the new Cabot Links and Cabot Cliffs in Inverness, which are less than 1 hour's drive. Consider another nearby course- Highland Links at the beautiful and prestigious Keltic Lodge at Ingonish Beach. Although we spend most of our time living in the States, we have canadian roots and love to return to Baddeck with family and friends to enjoy sailing, biking, golf, fishing, kayaking, hiking and more. We hope you will discover and connect with this special place and come back often. Wireless internet, cable TV, and newly added 2nd bathroom on second floor. Easy access to private beach area on Bras D'or Lake. 1 queen, 2 fulls, 2 twins. Separate bunkhouse for kids, hiking trails, and easy access (5 min) to town. We really enjoyed our relaxing four days at the Green Gables Farmhouse by Baddeck Bay. The six of us had been moving along, sleeping in a different town every night and so were very happy to stay still for a few days here. What a relaxing location! Lovely old home, much loved, nicely set up for us, perfect accommodation for us. What more can we say than our stay at the Farmhouse was PERFECT!! We loved the house from the minute we walked through the door. I was an ideal, central location for our group of 7. Peaceful and serene, quiet and private yet still close to town for whatever we might need. The house was spotless when we arrived and had everything you could possibly need on hand. An ideal get away. We were sad to leave and can't wait to go back! We had a wonderful week in Green Gables. The house is exactly as it's pictured. It is old, but very solid. The stairs don't creak, the plumbing is excellent, and it is impeccably clean and tidy. We have stayed in many places that are only a few years old and many of them lack any kind of character at all. This place has loads of character and everything works like a charm. The setting great. It is secluded without feeling like you are completely cut off from the world. There are neighbours across the road at the end of the long driveway, and Baddeck is a short drive away. There are great beaches both nearby and a little further afield. We loved both Big Pond beach on Bras D'or and the one at West Mabou. Kidston beach, also very nice, is a short ferry ride from the town dock, but dogs are not allowed on the ferry or on the island. There are many things to see and do in Baddeck if you decide to explore the town. The Alexander Graham Bell museum is awesome, there is a theatre company, ceilidhs are held in a few locations and archery a few nights a week at the curling club. Our kids loved the archery. Our fifteen year old said that the key to a good vacation for him is good WiFi. Green Gables has it, and he used it - a lot! We enjoyed our nine day stay in this old farmhouse, which was built around 1900. The house has wood slat floors that slope a little due to age, but this just adds to its character and quaintness. It brought back memories of when I used to visit Cape Breton with my grandmother when I was a kid in the 1960's. It was very clean when we checked in and was well stocked with everything you need for an extended stay. The beds were quite comfortable. The land around the house is picturesque and quiet, which makes for a very relaxing setting, and it's a pleasant drive of only 5-10 minutes to Baddeck for restaurants and shopping. Wifi connection was excellent. Two modern conveniences missing were a dishwasher and television; we didn't miss a dishwasher that much, but for the price I think the house should have a TV. In summary, I recommend this place; it was so much nicer than staying in a hotel. Green Gables was everything promised and more. The home was comfortable, very clean and situated in a quiet, intimate setting, so near to all the bustle of tourism. It allowed us to relax after well filled days of touring the Cabot Trail, golfing, visiting historic sites, enjoying Celtic music and of course fine dining. Our hosts were warm and hospitable folks, who were a pleasure to meet. I would recommend Green Gables to any travelers to beautiful Cape Breton!